The Teen Boxing Club is a co-ed group of mainly high school students from age 13 to 18. 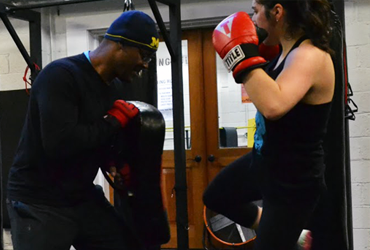 The club is designed to teach teens the basic elements of boxing and kickboxing such as basic boxing and kickboxing stances, an array of punches, kicks and punch kick combinations. The class will progress from the basics to learning the art of defense and how to counter punch and kick through partner work with focus mitts, Thai pads, and defense drills, for different combat situations including controlled sparring with mouth guards and head gear. The Teen Boxing Club program is ideal for any teen who would like to learn boxing and kickboxing. Some of the best candidates for this club, are not involved in team sports. 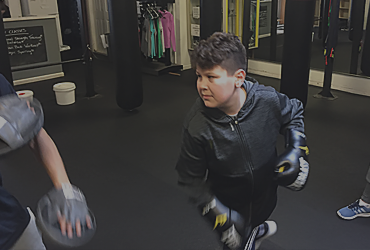 At the same time, the Teen Boxing Club is a great cross training option for teens who already play team sports and is looking to improve their hand eye coordination, overall strength, speed, and agility. Other benefits of the club includes: improved balance, footwork, explosiveness, flexibility, and self-confidence. The Club will meet on Monday, Wednesday and Friday from 4:00 pm to 5:30 pm. Classes will will begin on Monday Sept 17th from 4:00 pm to 5:30pm.